Listen to "Small Great Things: A Novel" on your iOS and Android device. Great book. Made you think about race relations in our country. This book was truly eye opening. Racism, hatred, compassion, respect, family and love are all meaningful themes. So many lessons for all. A remarkable story. I could not put it down. I loved this book. 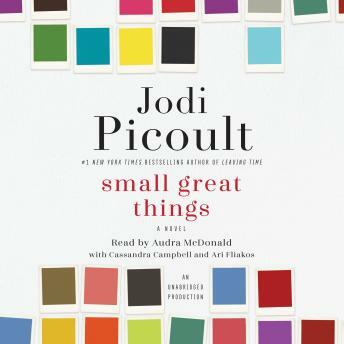 I have been a fan of Jodi Picoult for many years, and will continue to be after this book. Wonderful twist, and kept me listening for 16 hours (not that easy to do)! Very typical of Jodi Picoult’s fascinating fictional stories, that certainly could be very real. I appreciate what the book is trying to do with different narrators for each character in the story, but the voice used for Kennedy’s character is hard to listen to, especially when she does her daughter’s voice. The rest are tolerable. Still giving four stars to the narrator because the story telling is good. A thought provoking and relevant book that delves into racism, hatred and subjects that are frankly hard to talk about and need to be. Ms. Picoult hit a home run with small great things! Good book. As a African American physician with 20 years of training, I have faced racism starting from very early in my training. This made it hard to believe the storyline, but this book was very well written and it is an important topic. Very good read. Everything about this book was so well done. It was extremely eye opening for me and all I wanted to do was talk to others who had read it when I was done. I also loved listening to the end to hear all of what Jodi did to prep and educate herself on writing this book. It was a great story, felt the emotions. I really enjoyed listening.